A very special Beast Gift! Bergamot & Emrys as DOLLS! Watch B&E on Animal Planet's Dogs 101! What do Bergamot & Emrys DO all day? Send in your photos to be a Photo of the week Star! A Little Sister Beast! Introducing Brandi! 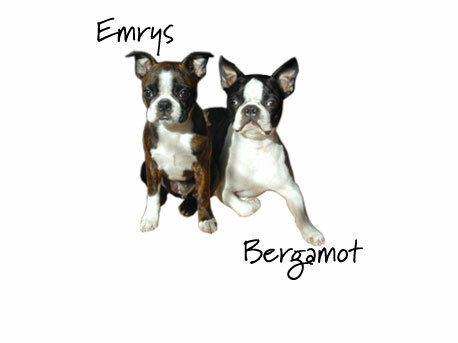 Bergamot Fury and Emrys the Nemesister welcome you to their site with Boston Terrier kisses - lots of them! To learn more about them, read their biographies and visit the photo album to see their puppy photos. What does LittleBeasts.com have in store for you? A Photo of the Week Caption Contest - vote on the photo of the week and add your own caption. A Puppy Cam - tune in to see The Beasts in action 24 hours a day. The Features section is a showcase of Boston Terrier cartoons, games and fun. Boston Terrier eCards - send a Boston Terrier card for every occasion. Shop the store for Boston Terrier art on t-shirts, mugs, and dog t-shirts that benefit Boston Terrier rescue. The links section is full of Boston Terrier resources, training and rescue information. Are you looking for an indestructible toy for your Boston? Read the Boston Terrier Challenge dog toy test reviews.